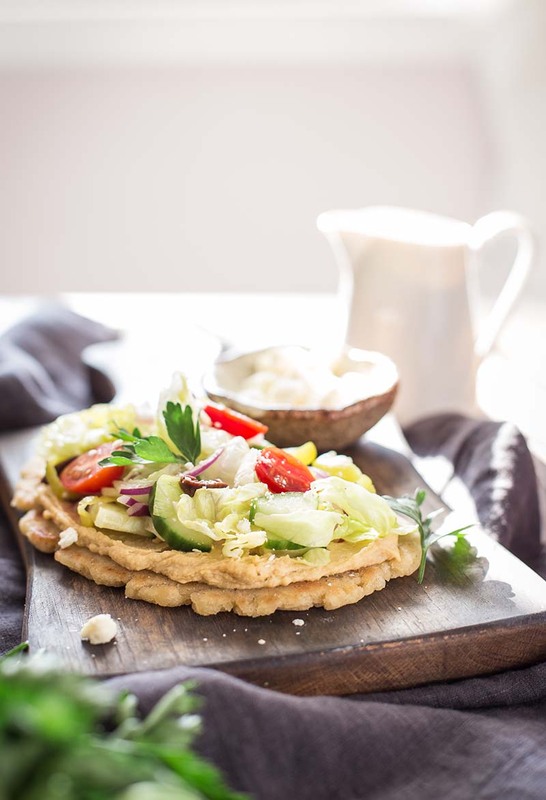 This homemade gluten-free naan bread is smeared with a thick layer of creamy hummus and topped with a heaping mound of Greek salad. Make the dough: In a measuring cup, whisk together warm water and sugar until sugar is dissolved. Gently stir in the yeast. Allow the mixture to rest for 5-10 minutes, or until the mixture becomes frothy. In a large bowl, combine flour, salt, and baking powder; whisk to combine. Add the olive oil, yogurt, and yeast mixture to the bowl. Using a wooden spoon or handheld dough whisk, stir until the dough comes together. Transfer the dough to a lightly-floured surface. Knead for 1-2 minutes, or until the dough is smooth. Place the dough in an oiled bowl, turning the dough to coat on all sides. Cover with a thin towel and place in a warm area to rest for 2 hours. Transfer the dough to a lightly-floured work surface. Gently shape the dough to form a smooth ball, and then flatten the ball to form a disc. Divide the dough into 6-8 pieces and roll each piece with the palm of your hand into a small smooth ball. Use a rolling pin to form each ball into a rustic oval-shaped disc, approximately ⅛-inch thick. Heat a cast-iron pan over high heat. When the pan is smoky hot, lightly brush some oil over the surface of the pan and place the rolled-out naan dough into the pan, one or two at a time, depending on the size of your pan. Cook each side for 1 to 1½ minutes, or until each side is golden brown and slightly charred. Repeat the process until all the dough disks are finished. If you're not going to serve the naan the same day, the bread can be stored in the freezer for up to one month. If you're serving the bread the next day, pop a piece in the toaster to re-heat and regain the soft texture. Make the Greek Salad: Add salad ingredients, minus the hummus and dressing, to a large bowl. Toss to combine. Assemble the pizza: Smear a few tablespoons of your favorite hummus over the warm naan bread. Top with a generous mound of Greek salad. Using a sharp knife, cut the naan into quarters. Drizzle with Greek dressing. Serve immediately. Recipe created by One Sweet Mess.